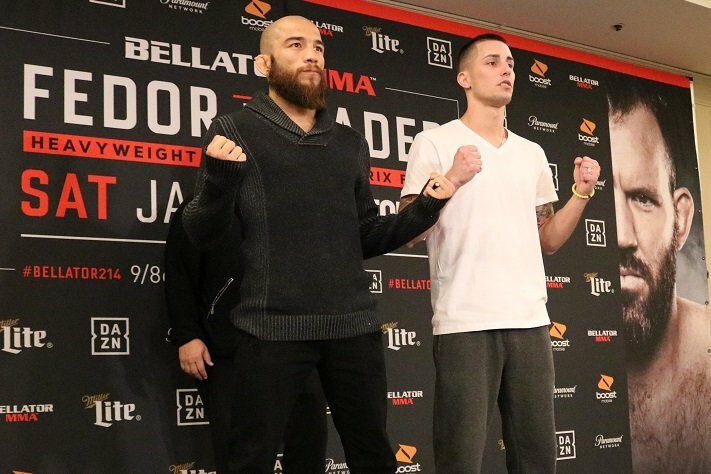 Ricky Bandejas proved a game opponent, but Juan Archuleta’s volume and aggression helped get the job done in a key bantamweight battle at Bellator 214. 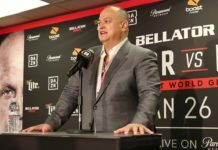 The upcoming Caldwell vs. Horiguchi 2 notwithstanding, Juan Archuleta vs. Ricky Bandejas very much felt like a title eliminator on Saturday night. 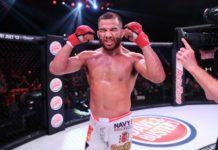 Going down at Bellator 214, the bout pitted ‘The Spaniard’ Archuleta, on a sixteen fight win streak, again Bandejas, who shocked everyone with his finish of James Gallagher last year. The catch, Archuleta was dropping to 135lbs for the fight, after spending his time at featherweight of late. Still, he didn’t seem phased by the cut, and had the fight down early, hands cinched with a body lock around Bandejas. For his part, Bandejas got right back up, but could not shake Archuleta off. When they finally did break, it was Archuleta going to the body, then firing a combo up top moments later. He fired a kick, nearly caught by Bandejas. Archuleta continued firing, knocking Bandejas off-balance. Bandejas recovered, only for Archuleta to go upstairs with a kick. Through the first half of the round, it was apparent why Archuleta had called for the bout. Yet Bandejas was still dangerous, slipping in a counter right hand near the midway mark. Archuleta was taking some big swings, and later ate a kick while changing levels. He fired back with a right hand to the side of the head, which forced Bandejas onto his heels. A last minute takedown attempt by Juan Archuleta would close out the round. Bandejas would connect with a right hand early in round two, and it appeared neither men was ready to take their foot off the gas. Movement, scrambles, and Archuleta pressing forward and swinging, those were common sights throughout the bout. Unfortunately, Archuleta wound up squinting in the second, having apparently been hit by an eye poke. Perhaps to buy himself some recovery time (as the ref never caught the foul), he closed the distance and drove Bandejas into the fence. That was short, lived, however, and the remainder of the round was a closely fought affair. Juan Archuleta opened the third round with a combo, as if to underscore the fact that he had the edge in volume to that point. They’d tie up, Archuleta looking for a takedown, but it wasn’t there, and moments later he ate a knee that stunned him! Somehow, ‘The Spaniard’ stayed standing. Even more incredibly, he charged forward moments later, hoisting Bandejas up and slamming him down for the takedown. Ricky Bandejas, however, was right back up. The takeaway from the bout, frankly, was that there was no quit in either fighter. The other big story, the takedown defense of Bandejas, which served him well in the final frame and allowed him to land some significant strikes as time clock wore down. Still, Archuleta had done enough, thanks to his volume, to seal the deal. He picked up the unanimous decision, in a fight closer than it appeared.